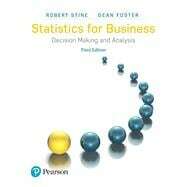 For one- and two-semester courses in introductory business statistics. The 3rd Edition of Statistics for Business: Decision Making and Analysis emphasizes an application-based approach, in which readers learn how to work with data to make decisions. In this contemporary presentation of business statistics, readers learn how to approach business decisions through a 4M Analytics decision making strategy—motivation, method, mechanics and message—to better understand how a business context motivates the statistical process and how the results inform a course of action. Each chapter includes hints on using Excel, Minitab Express, and JMP for calculations, pointing the reader in the right direction to get started with analysis of data. MyLab™ Statistics from Pearson is the world’s leading online resource for teaching and learning statistics; it integrates interactive homework, assessment, and media in a flexible, easy-to-use format. MyLab Statistics is a course management system that helps individual students succeed. It provides engaging experiences that personalize, stimulate, and measure learning for each student. Tools are embedded to make it easy to integrate statistical software into the course. Note: You are purchasing a standalone product; MyLab™does not come packaged with this content. Students, if interested in purchasing this title with MyLab, ask your instructor for the correct package ISBN and Course ID. Instructors, contact your Pearson representative for more information. Robert Stine holds a Ph.D. from Princeton University. He has taught at the Wharton School since 1983, during which time he has regularly taught business statistics. During his tenure, Bob has received a variety of teaching awards, including regularly winning the MBA Core Teaching Award, which is presented to faculty for outstanding teaching of the required curriculum at Wharton. He also received the David W. Hauck Award for Outstanding Teaching, awarded to the most highly rated faculty member teaching in the Wharton undergraduate program. Bob actively consults for industry. His clients include the pharmaceutical firms Merck and Pfizer, and he regularly works with the Federal Reserve Bank of Philadelphia on models for retail credit risk. This collaboration has produced three well-received conferences held at Wharton. His areas of research include computer software, time series analysis and forecasting, and general problems related to model identification and selection. Bob has published numerous articles in research journals, including the Journal of the American Statistical Association, Journal of the Royal Statistical Society, Biometrika, and The Annals of Statistics. Dean Foster holds a Ph.D. from the University of Maryland. He has taught at the Wharton School since 1992 and previously taught at the University of Chicago. Dean teaches courses in introductory business statistics, probability and Markov chains, statistical computing and advanced statistics for managers. Dean’s research areas are statistical inference for stochastic processes, game theory, machine learning, and variable selection. He is published in a wide variety of journals, including The Annals of Statistics, Operations Research, Games and Economic Behaviour, Journal of Theoretical Population Biology, and Econometrica. Dean is currently Senior Principal Scientist at Amazon, working on big data, with the goal of predicting the sales of each and every item that Amazon sells.